Farid-ad-Din Muhammad Attar (1145-1220) is one of the three pillars of Persian Sufi literature. Sana’i Ghaznavi, who for the first time, exerted love poetry to beings beyond human material affections, and Jalal ad-Din Muhammad Balkhi, Mowlawi (Rumi) are considered to be the other two. Professor Shafiei Kadkani places Hafez, the other mystical Persian poet in a category of his own. He believes Persian Sufi poetry began with Sana’i, perfected with Attar and reached its peak with Mowlawi. Sana’i is the first poet who brings a worldview of mysticism to Persian poetry. Attar (the literal meaning: herbalist and perfume maker), is the first Sufi poet/ writer who dedicated all his works to Sufism. He never served any court or a king – “ Not a morsel have I tasted from a tyrant’s table…” In all his poetry hardly a single line has a meaning and reference beyond a gnostic view of being. Attar was eventually killed during the Mongols invasion. Attar did not reach much fame as a poet during his lifetime. Nearly three hundred years after his death, in the fifteenth century, he was recognized as a Sufi poet. 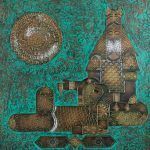 Some works are attributed to Attar, of which Tadhkirat al-Awliya (Memorials of the Saints), Ilahi-Nameh, Mukhtar-Nameh, Diwan, and Conference of the Birds (Manteq-ut-Tayr) have been verified. Attar’s connection to Sufism is not entirely clear (1). No Mentor, Guide, or Sheikh, as it was the tradition of mystical learnings is known to have been Attar’s instructor. “Rumi believes that Attar had, in fact, no teacher and was instructed in the Way by the spirit of Mansur Hallaj, the Sufi martyr who had been executed in Baghdad in 992. Conference of the Birds, which is just under five thousand lines in original Persian (about the length of Dante’s Inferno) is built around the main core of Sufism: soul’s quest to unify with God. A flock of birds gathers and acknowledge the Great Simorgh as their King and leader. They have to fly to the ends of the earth – mythical Qaf Mountain to find him. Attar took the title from a passage in Koran about King Solomon and his claim that he knows the language of the birds. The birds’ journey is led by Hoopoe, Solomon’s trusted messenger. At the beginning of the journey to find their king, each bird presents an excuse for not being able to make the journey. In his role as the spiritual guide, the hoopoe tells the assembled birds many short parables and addresses their hesitations, complaints, fears, vanities, and questions. He tasks them to renounce their material comforts and their fears and join him on the journey, passing through seven valleys to reach Simorgh. First is Valley of the Quest. Second is Valley of Love, where reason is abandoned for the sake of love. Third, is Valley of Knowledge. In this phase, worldly apprehensions become utterly useless. The fourth valley is Valley of Detachment. All material desires and attachments are given up. Fifth is Valley of Unity, where the Wayfarer realizes that everything is connected and the Beloved is the force behind every harmony, multiplicity, and eternity. Valley of Bewilderment is the sixth valley where Wayfarer perplexed by the beauty of the Beloved, finds he or she has never known anything. Finally, the Seventh is Valley of Poverty and Annihilation. 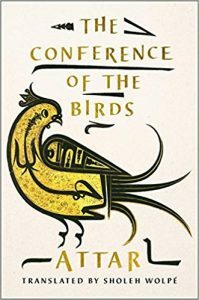 There could be no better introduction to Sufism thinking and way of life, than Attar’s Conference of the Birds. The aspirant has to purify his ‘nafs” (his self), from its inclination to “shahwat” that is the thoughts and desires of the natural man, and substitute these with “mohabbat”; then must be cast into the flames of passion “eshgh” to emerge in the state of union “wasl” with transmutation of self “fana” through the gift of bewilderment and dazzle “hairat” to everlastingness “bagha”. Correctly keeps to the established rule. The eminence I have suffices me. Some arid wadi with no end in view. The all-important fact of purity. Who snatches at a crown and thinks he rules. Un-rivalled in his firm fidelity. Finally, the group of birds adopts hoopoe as the leader and the guide and begin their journey. It is within these encounters with the birds and their questions and concerns that Attar puts anecdotes and parables of human flaws and strengths into his narrative. At last, the birds reach the court of Simorgh. First, they are rejected, but finally, they are admitted and find that the King and Leader Simorgh they have sought is none other than themselves. Only thirty (si) birds (morgh) are left at the end of the journey. (si in Persian means thirty and morgh means bird). Thus, si morgh meet Simorgh. 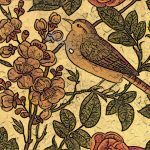 Attar’s long poem is the emphasis on two major themes of Sufism: the necessity to purify one’s self from all desires, to reach a level of passionate love that is a union with the beloved. Attar’s “Manteq ut-Tayr” is composed in Masnavi (Mathnawi) format. This format is written in rhyming couplets, more specifically independent, internally rhyming lines. Masnavis usually follow a meter of eleven or ten syllables but have no limit on their length (a range of 2000 to 9000 “Bayts” (verses). Masnavi is the most common platform used by classical Persian poets. Its structure consists of an introduction (invocation), the main body of the story and an epilogue. Unlike other formats of Persian poetry, and due to the narrative structure of Masnavi, any book or story composed in this style is meant to be read through, as the context clarifies the meaning (allegories). Famed Persian Masnavis; “Masnavi Ma’nawi” by Jalal ud-Din Rumi, or Conference of the Birds are full of allegories that without their contextual, mythical, and mystic references appear as simple parables. Destroy its hold on you and reach your goal. 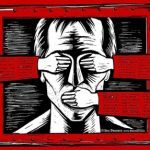 If you are told: “Renounce our Faith,” obey! The Self and Faith must both be tossed away. 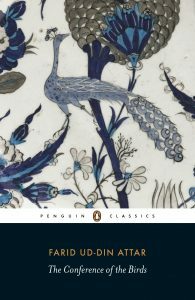 The most recent translation of Farid ud-Din Attar’s Conference of the Birds is done by Sholeh Wolpé (Norton, March 2017). Wolpé’s introduction on the story and Sufism is interesting. Her explanation of Attar’s poem at some instances aims misguided extremism inflicted our world today. She insists that her version “is not a translation of form, nor is it a scholar’s translation.” She has used the most recent and complete Persian version of “Manteq u-Tayr” edited by Mohamad Reza Sahfeii Kadkani (Although professor’s last name is misspelled as Kandaki! Ironically, Kadkan is the birthplace of both Attar and professor Shafiei!). Whether in “rhyming couplets” or “poetic prose” the availability of this Persian masterpiece of Sufi literature is a precious opportunity.